The Creative Sound Blaster brand has been carrying weight in the computer audio world for many years, though some recent releases have been poorly received, diminishing the name somewhat. Can the Creative Sound Blaster EVO Zx headset restore the Sound Blaster reputation? In some ways, the Creative Sound Blaster EVO Zx is a bit of an odd proposition. There's no denying that it looks the part, with a stylish folding design in the red and black hues of the Creative Sound Blaster Tactic3D Rage. However, unlike the Tactic3D Rage, the Creative Sound Blaster EVO Zx isn't primarily built for gaming, though it does share some features. A dual mic array is built into the right headphone, offering decent noise cancellation and good recording quality without having an intrusive arm sticking out of the headset, like many gaming headphones have to deal with. Creative's Crystal Voice technology does a fair job of cleaning up the sound quality, and you can tweak it using the downloaded software or smartphone app. The software also gives you easy access to equalisers and virtual surround sound effects. This is where the similarities to the gaming-centric Tactic3D Rage end, however, and a headset designed more for mobile use emerges. For example, while the Creative Sound Blaster EVO Zx is wireless, it connects via Bluetooth, with a desktop PC-friendly dongle conspicuous by its absence. If your PC isn't Bluetooth-equipped, you'll be tethered to the USB cable that comes with it, which is also used to charge the headset. If you want to use the virtual surround sound effect - which is alright but once again no comparison to a physical 5.1 speaker setup - then you'll need to connect via USB. Bolstering the Creative Sound Blaster EVO Zx's mobile credentials is the inclusion of NFC (Near Field Communication) technology, which enables you to quickly and easily pair up the headset to an NFC-capable phone or laptop (such as the Sony Vaio Duo 13) by briefly tapping the devices together. It works well and is a welcome feature, which goes some way to justifying the Creative Sound Blaster EVO Zx's high price tag. Controls on the right of the headset offer quick access to volume and playback controls, along with turning on the fancy SBX effects. One of the features that Creative is particularly pleased about on the Sound Blaster EVO Zx is the inclusion of the SB AXX1, a piece of technology more often found in Sound Blaster's sound cards for PCs. It was also included in the Creative Sound Blaster Axx SBX10 speakers, which didn't blow us away with their sound quality. The closer environment of the Sound Blaster EVO Zx headset sounds much better, with the SBX effects making a noticeable difference to the feel and depth of the music. 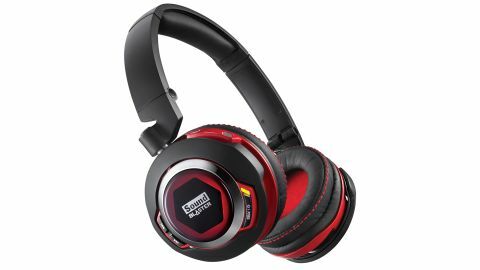 With a £199.99 / US$249.99 / AU$279.95 asking price, the Creative Sound Blaster EVO Zx is an expensive headset. There's some genuinely good technology in these cans, and it's great to see some more NFC-sporting bits of kit. If you use these headphones with a desktop PC, however, you won't get much out of most of this tech, especially if you have a fancy sound card - since the SB AXX1 chip bypasses any sound cards.